A freestanding punching bag is an invaluable asset for anyone looking to train at home. Although a hanging bag will provide a better training experience, not all of us are blessed with the luxury of having somewhere to hang it. That’s where free standing punching bags come in. Unfortunately, deciding which free standing bag to buy can be tough. 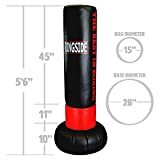 That’s why we’ve put together this list, ​to discuss the best free standing punching bags currently available and provide you with all the information you need. No beam or bracket required: The first major benefit of using a freestanding heavy bag is the fact that no beam or mounting is required to hang it. Not everyone is able to find a suitable beam to hang their bag from or wants to buy a heavy bag stand. Convenient: Being able to use the freestanding punching bag wherever you like is extremely convenient. You’re also able to easily put the bag away whenever you’re done and want to keep it out of site. You also don’t have to worry about attaching a mount to your ceiling, which is a huge time saver. When looking to invest in a heavy bag, you will be faced with two options; hanging bags and freestanding bags. Both have the benefits and draw backs, which I will discuss below. Freestanding heavy bags require far less space than a hanging bag. They don’t swing from side to side, don’t require a hanging beam and no external parts are required to set it up. For those with limited space, for example living in an apartment, a free standing heavy bag is by far the more suitable option. In terms of brands, the free standing bag market is pretty much dominated by Century, which although are insanely high quality products, doesn’t leave many options for us. Hanging heavy bags have been around significantly longer. As such, they come in a variety of different models, for example regular bags, uppercut bags and maize bags. Being able to swing from side to side, a hanging heavy bag will allow you to throw your strikes with more force. Although free standing heavy bags tend to be weighted with either water or sand, they can end up toppling over if you throw your strike with enough power. To sum it up, freestanding punching bags are a great alternative if you’re unable to hang a heavy bag in your home. Unfortunately, if you’ve got a hard punch, you may end up moving the bag from side to side and even end up knocking it over. Instead, they’re much more suited to developing your cardio and technique when outside of the gym. It’s worth noting that if you’re a larger male looking to work on your kicks, a larger self standing bag will be more suitable. This is because a larger bag will be heavier and therefore harder to move and knock over. The top free standing punching bags will have a solid and wide base that should help keep it in place. As I mentioned earlier, the number one downfall of using a floor standing heavy bag is how easily they’re knocked over. As such, the size and weight of the bag will have a direct impact on how much force it can withstand. Bigger free standing bags will be able to withstand more power without toppling over. If getting a smaller bag is your only option, make sure it has a wide base that can be filled with sand and water. Top tip: Only fill your base with sand once you’re happy with its location. Moving your bag with sand inside is incredibly difficult and is a lot harder to drain. Use water first until you’re happy with where your free standing bag is placed. There are a number of different designs and variations of free standing punching bags. 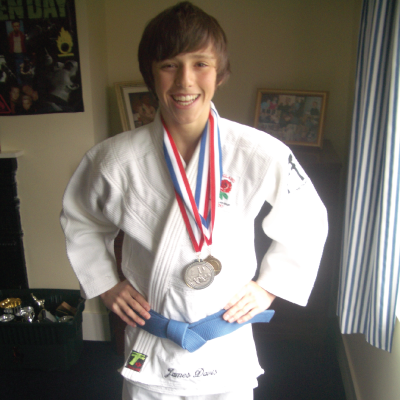 Some are designed for training your striking, whilst others are able to double as a grappling dummy. Before investing in a free standing heavy bag, you should first consider what you’re aspects you’re looking to develop. If you’re looking to train your punches and leg kicks, a larger bag with a solid base will be more suitable. Alternatively, if you’re looking to develop your grappling, find a free standing bag able to be transition to the ground is key. Luckily, we cover a range of designs on our list of the best free standing punching bags, so you’re bound to find one suitable for your requirements. Unfortunately, free standing heavy bags don’t come cheap. You can expect to pay anywhere between $180 and $400. Larger, higher quality free standing bags will cost more, however be much higher quality and able to withstand more powerful strikes. Punch & Kicks Bags: Large free standing bags with a wide, solid base that’s often filled up with water or sand. Fitness Bags: Tend to be smaller & lighter than other types of bags and are designed for cardio workouts. Hybrid (Punch & Grapple): A striking bag that doubles as a grappling dummy. First up on our list of the best free standing punch bags is the Ringside Elite. Unlike many other free standing bags on the market, the Ringside Elite is able to take an absolute beating and remain upright. This is thanks to the spring-loaded design that allows the bag to swing back and forth instead of falling over. This is also a great feature for fighters looking to work on their timing and footwork. Measuring at 6’4”, the Ringside Elite Freestanding Bag is the largest on our list. When filled with water or sand the bag can weigh up to 270lb, which provides it with a solid base that helps prevent it from falling over. The exterior of the bag is made using dense shock-absorbing foam that is lined with high quality synthetic leather. The bag also comes with a foam pad that can be put around the base for extra protection when kicking. There are a couple of downsides to this bag, although they’re pretty minuscule. Firstly, after repeated use the spring can start to squeak, which can easily be fixed with a bit of WD40. Also, Ringside made the hole in the base painstakingly small. If you plan on using sand in the base, it can be a messy job and take a fair amount of time. Other than that, the Ringside Elite is one of the top free standing heavy bags currently available. If you’re fairly large and have a powerful kick, this is probably the most suitable bag for you as it is pretty tough to knock over. If you want anymore information, head on over to our full Ringside Elite free standing bag review. 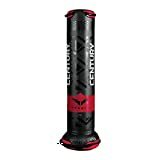 Standing at 5ft 9”, this extra large free standing heavy bag from Century is designed for hard hitting fighters looking to develop their striking. 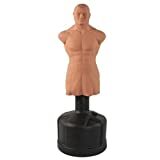 The punching bag features a wide 18inch diameter with a solid plastic base that can be filled with either water or sand. When assembled and filled, the Century Wavemaster has a total weight of 270 pounds. The tall design of the bag allows you to develop throwing strikes targeted at the entire range of the body. This is a great feature as other free standing bags require you to adjust their high manually in order to work on different strikes. One thing you will notice is that the Wavemaster doesn’t have much sway, as unlike the Ringside, it’s not spring loaded. This means that if it is hit too hard, it can be knocked over, especially if you’re a big guy. The surface of the bag is manufactured using a durable vinyl cover, layered over high-density shock absorbing foam. The round design of the base means that the bag can easily be rolled from one place to another. It’s also available in black, red and blue designs. To be honest, the Wavemaster and the Ringside Elite free standing bags are extremely similar. If you’re looking to an easy to move free standing heavy bag, then go for the Century. If you’re looking for a bag that’s able to withstand high powered strikes, go for the Ringside. Just be aware that the Ringside can be pretty tough to move, especially when it’s filled with sand. Overall, the Century Wavemaster XXL is one of the best bags on the market. It’s built to last, allows you to develop an array of striking techniques and is easy to move around. We've also discussed the XXL in our in-depth Century Wavemaster Review, so give that a read if you're looking for anymore information. Take a look at this video to see the difference between the Century and Ringside free standing heavy bags. The Century BOB (Body Opponent Bag) XL is life like free standing punching dummy. The realistic design of the bag allows you to practice delivering strikes to a specific part of the body. As such, the Century Bob is an incredibly popular bag seen in many gyms across the country. Like many other of the items on our list, the plastic base is able to hold up to 270lb of sand or water, providing a heavy and stable structure for the bag. The body is manufactured using high quality urethane foam, that’s both tear resistant and long lasting. Due to the firmness of the bags build, you should train with the Century Bob using gloves or wraps. The Century BOBs low centre of gravity and wide base allow the bag to withstand a fair amount of impact without falling over. In fact, it’s one of the most stable floor standing heavy bags I’ve used and requires a fair amount of force to knock it down. The Century BOB is available in two sizes, with the XL model featuring a full torso design with upper legs. The ​regular sized versions is slightly cheaper and only features the upper torso. Overall, it’s easy to see why the Century BOB is such a popular choice amongst martial arts instructors. It allows you to familiarize yourself with striking specific parts of the body and is incredibly tough to knock down. As always, we've taken an even more in-depth look at the body opponent bag in our full Century Bob Review. The Century Versys Fight Simulator is a free standing punching bag designed specifically for transitioning from stand up to the ground. As such, the Century Versys is much more suited to MMA than any other martial arts. In fact, I would say that it's only suitable for MMA, as the bag falls over extremely easily. Although a fantastic feature for MMA practitioners looking to develop their ground and pound, it isn’t really suitable for much else. Located at the top of the bag are handles that you can hold onto when training your knee strikes. The bag also provides a wide surface area for you to develop and array of strikes targeted at different areas of the body. The bag itself weighs approximately 100lbs and comes ready to use, without the needing to fill the base with water or sand. 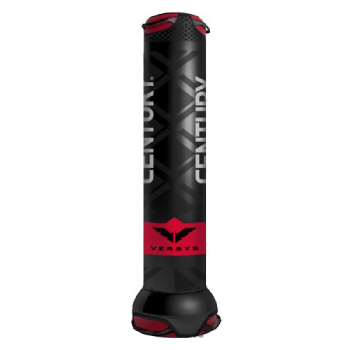 Overall, the Century Versys is incredibly versatile and one of the best MMA punching bags. We've also discussed some of the other version of the Versys in our full Century Versys review if you want to check that out. The Everlast Omniflex is a great option if you’re looking for a high quality free standing bag on a budget. Costing less than $150, it really is the best cheap free standing punching bag you’re going to find. The bag features an adjustable height system that allows you to move the bag up and down to your preferred setting. This is great as it allows you to work on a variety of striking methods, however does mean you have to keep on adjusting the bag mid work out. When at its highest setting, the Omniflex measures at 5ft 7” and can weigh a total of 130lbs when filled with sand or water. The bag itself is manufactured using high quality shock absorbing foam with a Nevatear outer lining that’s extremely durable and helps to prevent tearing. The base of the free standing bag doesn’t take up a tonne of room and can easily be rolled from one place to another. 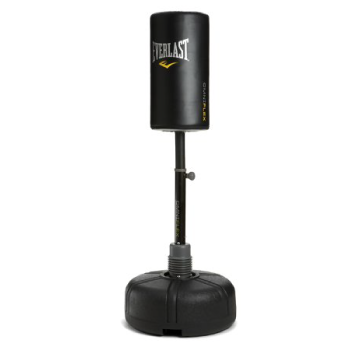 If you’re looking for a cheap free standing punching that’s easy to store and costs less than $150, the Everlast Omniflex is a fantastic option. I would say that the freestanding Everlast bag is more suited for beginners as it can fall over pretty easily when struck with enough force. This is the unfortunate reality of most free standing bags however the thin design of the Everlast bag makes it extremely susceptible to toppling. If you want to read a bit more about this, you can check out our full Everlast Omniflex review for more information. Although having a very similar name, the Century 2XL Pro is not to be confused with the Century Wavemaster XXL we discussed earlier. The two are very similar, however the 2XL Pro features some slight improvements to the older model. One such improvement is the locknut located at the top of the bag. This helps to secure the bag to the base and prevents it from coming lose. You will notice that cheaper bags come lose from their base due to the repetitive impact they endure. Fortunately, Century has found a way to combat this problem and it works incredibly well. Aside from that, the other major differences are purely cosmetic. The Century 2XL pro is available in red, black and blue, all of which feature the typical Century branding. 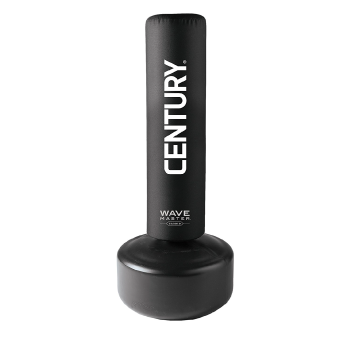 The Century Wavemaster 2XL Pro is manufactured using high-density, impact absorbing foam and is in fact the most well padded model released by Century to date. 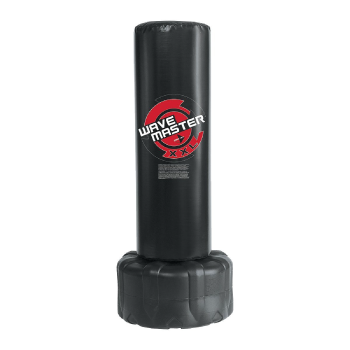 Similarly ​to some of the other best free standing punching bags, the ​Century Wavemaster XXL features a tapered base that weighs approximately 270lbs when filled with water or sand. 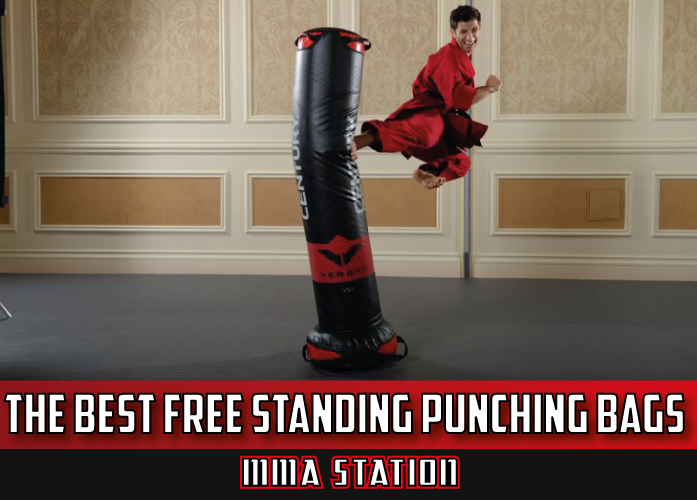 Although an incredibly high quality free standing punching bag, it does cost a fair amount of money. Being the most expensive model on our list, I feel that I couldn’t place this in the top positions, as it doesn’t quite offer as much value for money as other bags. 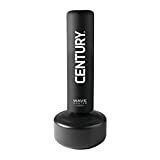 Having said that, if budget isn’t an issue, then the Century Wavemaster 2XL Pro is easily one of the best punching bags around. Wavemaster 2XL Pro features the most padding of all the Wavemaster bags, plus a longer striking area for practicing kicks and punches. 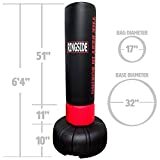 The Ringside Fitness Punching Bag is a great free standing heavy bag for those of you are looking to work on your cardio. This isn’t a bag designed for throwing full force punches; instead it provides a way for you to work on your fitness and striking at the same time. Although it looks similar to the Ringside Elite bag we discussed earlier, there are some major differences. For example, the fitness bag is 10 inches shorter than the other model, with a smaller, lighter base that is able to hold approximately 140lbs of sand or water. It’s worth noting that the hole in the base is pretty small and will require some form of funnel if you’re looking to fill it with sand. The exterior of the bag is lined with shock absorbing foam, which is then encased in a layer of durable vinyl material that’s both firm and tear resistant. If you’re looking for the best free standing punching bag designed for cardio workouts, the Century Fitness Bag is a fantastic option. 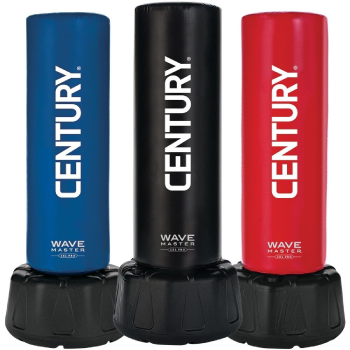 Moving onto the final model on our list of the best free standing ​punching bags, the Century Aerobic Wavemaster. This is another bag designed for cardio work outs as opposed to other models on our list that are designed to with stand high powered strikes. This is very similar to the Century Wavemaster we discussed earlier, however is smaller in pretty much every way. The bag is smaller, with a smaller base able to hold up to 170lbs of water or sand. As such, the Cardio Wavemaster isn’t ideal for full striking workouts, but is perfect for working on your fitness and endurance. When striking the Century Aerobic Wavemaster, don’t put your full force behind the strikes or you will find yourself picking having to pick up the bag every other punch. The bag itself features shock-absorbing foam that helps to dissipate the force felt on your body. Although, it’s still a good idea to train using gloves or wraps, just to provide your hands with extra protection. The bag has three colour options; black, blue and red with the standard Century branding. Overall, the Century Cardio Wavemaster is a great bag for beginners, or for those of you looking to improve your fitness whilst focusing on your striking. How Do I Set Up My Free Standing Punching Bag? Setting up your free standing heavy bag will vary from brand to brand. However, there are three main components of all free standing bags. The plastic base at the bottom, the main body and the joint connecting the two. When it comes to filling your base, you will have a choice between water and sand. There are pros and cons of each that I will discuss below. Water is the most popular choice, due to the fact that it is a lot easier to fill the base with. Unfortunately, when you hit the bag, the water can move from side to side, which can in turn cause the bag to slide along the floor. Water is also a lot easier to empty as well, which in turn make the bag a lot easier to move. If you’re setting up your free standing bag for the first time, I would use water to begin with until your certain where you want to have the bag. Sand however, provides a much heavier and stable base. Unlike water, sand wont move side to side when your strike the bag and will do a better job at keeping it in place. Unfortunately, sand is a lot harder to get into the base and often requires the use of a funnel, which can be pretty time consuming. Similarly, it can get pretty damn messy when you try and empty sand from the base, so make sure your happy with where the bag is before you use sand. To summarize, if you’re planning on moving your bag often, use water. If you’re happy with the bags location and want a sturdier base, use sand. Also, make sure you've got a good pair of gloves suitable for heavy bag training. Repeated blows to your bare fist can cause a lot of injuries and problems down the line. 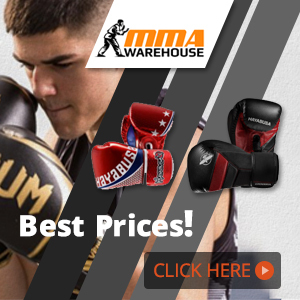 If you haven't got a pair, check out our list of the best heavy bag gloves for some great options. Check out the video below for an awesome 10-minute, high intensity interval training work out you can do with your new free standing punching bag. 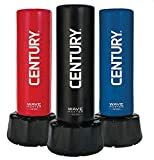 As you can probably tell from our list, Century is dominating the free standing heavy bag market. To be honest, that’s not such a bad thing. Their products tend to be built to an exceptionally high standard and are a popular choice amongst martial arts instructors. 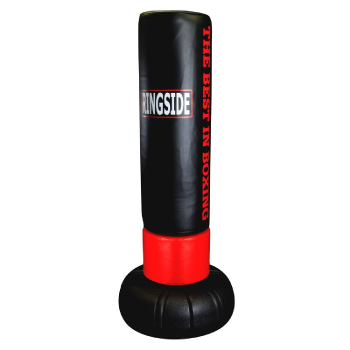 Ringside are the manufacturer of some of the best free standing heavy bags currently available. 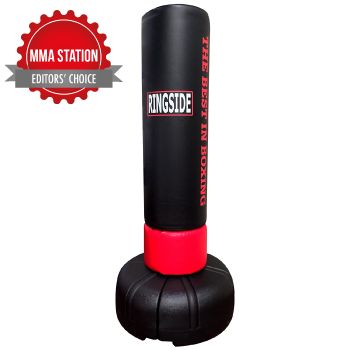 Their latest bag, the Ringside Elite, is currently one of the most used free standing heavy bags in MMA gyms due to its solid build and versatile design. Everlast are the manufacturer of some the top boxing and martial arts equipment currently available. 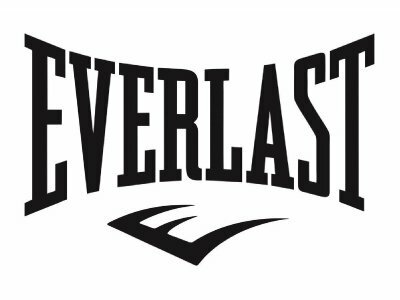 Originally making their name in boxing, Everlast have continued to release a number of different products tailored for different combat sports. Their products tend to be affordable, high quality and long lasting. Thanks for taking the time to read our list of the best free standing punching bags. If you have any questions, please feel free to comment below!